As December 31, 2012 approached you watched the proceedings in Washington unfold. Would taxes rise? Or would the politicians overcome their ideological differences and reach a compromise agreement? There was a rare Sunday session of Congress, a political stand-off, proposals and counter offers and of course the blame game. In the end the White House and Congress did a deal in extra time and saved America from plunging off the fiscal cliff. The astrologer watched the proceedings unfold too, but didn’t know if a compromise would be reached. Nobody did. But three astrological charts did provide an account of what was going on and what might happen. Astrology, and the planets, can predict how the parties involved are inclined to behave but it was up to them to recognize when their conduct was destructive and prone to have harmful consequences. How they behaved was up to them — not the planets — and each had the free-will to change. So the astrology influencing the proceedings didn’t announce: here’s the event. The astrological energies being released have a harmony or discord potential and the inclination for ‘bad’ behavior and destructive events can be measured by the amount of discord influencing the proceedings. So an astro-analysis requires an assessment of the harmony and discord data in the relevant charts and discord reveals what’s going wrong. And the US ‘fiscal cliff’ was a classic study in how astrological discord can play itself out on the world stage when selfishness overwhelms good-sense and jeopardizes a country’s economic wellbeing. And selfishness, even though it’s easily justified by clever economic argument, is still the most destructive driver in the human soul’s emotional tool-kit. 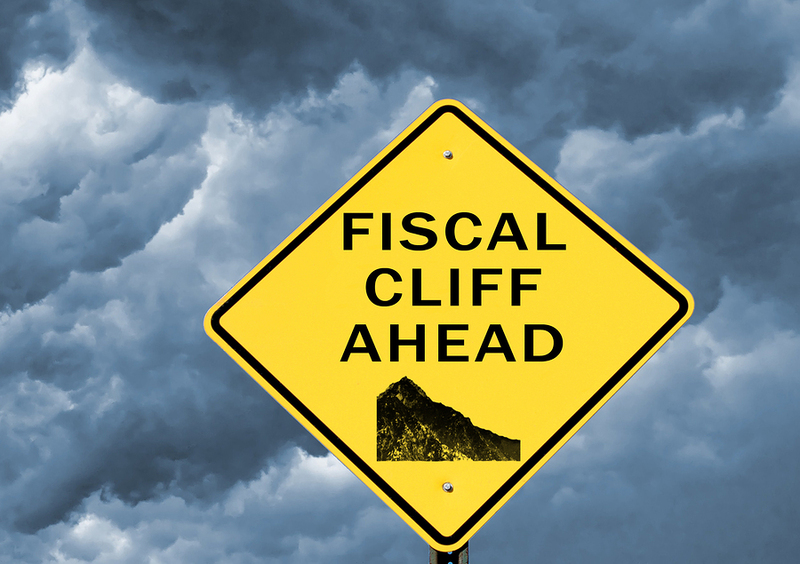 The fiscal cliff referred to the effect that a number of laws (house 9) which if unchanged could result in tax increases (house 8 and Jupiter), spending cuts (Saturn), and a corresponding reduction (Saturn) in the budget deficit for 2013. It was a financial event and this turned the astrological focus on the financial planets — Jupiter and Saturn — and the financial houses — 2 and 8. The charts influencing the event were the US birthchart, the US Aquarian Age chart and the Sagittarius — December 13, 2012 – New-Moon chart. The US has several birthcharts but the 7 Gemini rising chart is just amazing. 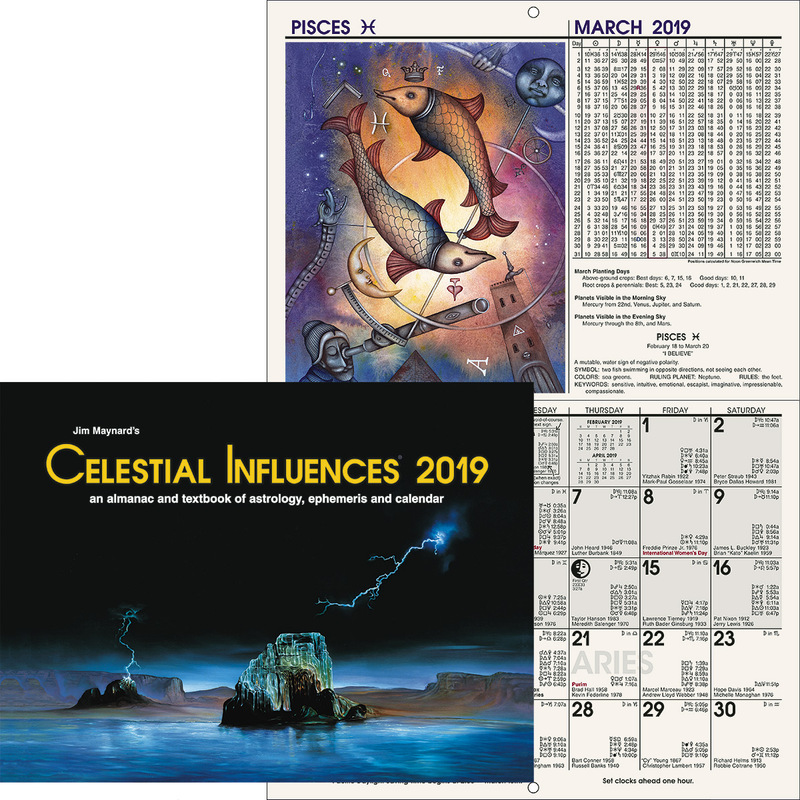 No matter the event — the civil war, the Great Depression, the bombing of Pear Harbor or Hurricane Sandy — the astrological events in the chart provide a logical explanation. It is a rectified chart and the minute on the ascendant and Midheaven may not be 100% accurate but the chart keeps on working. 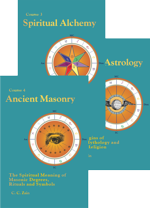 On January 1, 2013 progressed Sun in the chart — the planet of politics (at 7 Pisces 34) — had moved to form a high-discord obstacle (square) aspect with progressed Uranus — the planet of liberty (at 7 Gemini 01) — in house 12 (self-undoing and secret, behind the scenes activity) and a high-discord obstacle (square) aspect with birthchart ascendant. Uranus and the ascendant stand for the US people and the Sun-Uranus square aspect marks for extremist politics. The Sun indicates important political events influencing the nation’s finances (house 2). Uranus is unpredictable. When there are two options you never know which one Uranus is inclined to take, but whatever eventuates usually involves unexpected developments and cataclysmic suddenness. And progressed Mercury (at 21 Aquarius 03R) — the planet of communication, talks and discussions — in house 10 (the President) had moved to form an agitation (sesquisquare) aspect with birthchart Jupiter — the planet of wealth and financial privilege in house 2 — and a luck (trine) aspect with birthchart Mars — planet of strife and guns — in house 1 (the people). The Mercury-Jupiter sesquisquare aspect, which marked for agitation at the financial talks, reaches its peak power and discord date on August 3, 2013. And the Mercury-Mars trine aspect, which marked for good-luck involving the people in the financial battle, reaches its peak power and harmony date on March 25, 2013. The high discord aspect influencing the financial trouble was progressed Jupiter (at 15 Cancer 27R) — the planet of wealth, finances and financial privilege — in house 2 (finances and banks) — square (obstacle) birthchart Saturn in house 5 (Wall St and risk). Jupiter and Saturn are the financial and business planets and the square aspect marks for a high-discord obstacle that’s adversely influencing America’s economy and financial prosperity. And with Saturn involved the obstacle can be summed up in two words — selfishness and greed. On January 1, 2013 birthchart and progressed Jupiter were in house 2 (finances) — and Jupiter is cusp ruler of house 7 (the other country) and house 11 (Congress). Birthchart Saturn was in house 5 (risk and speculation) and progressed Saturn was in house 6 (work) — and Saturn is cusp ruler of house 8 (taxes and debt), house 9 (laws, the constitution, trade and philosophy) and house 10 (the administration). And conflicting political philosophies were an obstacle to the nation’s financial (Jupiter) and economic (Saturn) prosperity. Then on November 24, 2012 progressed Moon moved to form a prominence (conjunction) aspect with birthchart Saturn in house 5 (risk and Wall St). The aspect reached its peak power and discord on December 24, 2012. And on December 15, 2012 progressed Moon moved to form an obstacle (square) aspect with progressed Jupiter in house 2. This aspect will reach its peak power and discord date on January 13, 2013. Jupiter is the plan et of good-will, last minute rescues and hope — the hope of finding a compromise — and Saturn is the planet of selfishness, pessimism, anxiety, falls and fear — the fear of not finding a compromise — and when the investors got frightened Wall St fell. This powerful stimulation by progressed Moon set-off the Jupiter-Saturn square bringing the aspect’s discord to a head. Progressed ascendant (at 18 Sagittarius 19) in house 7 had moved to form an opportunity (sextile) aspect with birthchart Moon in house 10 (the President) so the President had the support of the people and the international community (ascendant and house 7). And with progressed MC (at 8 Libra 48) in house 5 trine (luck) birthchart Uranus mapped there was some unexpected good-luck that could benefit the people (Uranus in house 1). Uranus is the planet that springs a surprise development at the very last minute. The question was: Could compromise and good-will (Jupiter) win out against selfishness, greed and self-interest (Saturn) with Jupiter — the planet of good-will, generosity and charity — under severe stress from two high-discord progressed aspects? 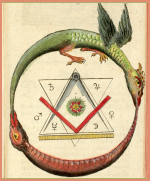 The Aquarian Age chart at Washington reveals that Congress has an important role to play in the America’s progress and development through the age. Neptune and Pluto are in house 11 (Congress) and there are currently six progressed planets and two important progressed aspects influencing the house. Progressed Sun (at 10 Gemini 25) has moved to form an obstacle (square) aspect with progressed Uranus (at 9 Virgo 43) in house 3; and progressed Jupiter (at 11 Taurus 46) has moved to form a prominence (conjunction) aspect with birthchart Neptune. 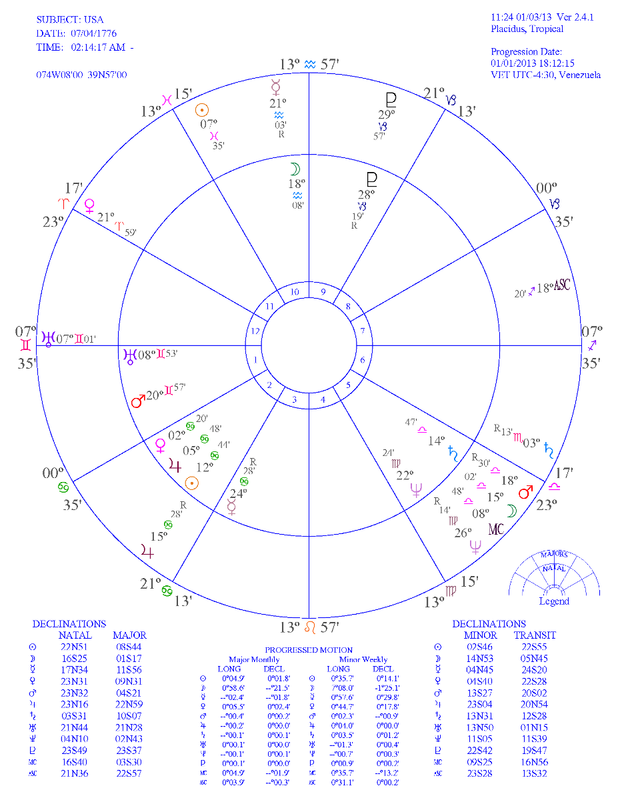 So in the US Aquarian Age chart these aspects are expressing through Congress. Specifically they reveal the role being played by Congress in the country’s financial and economic woes — Sun is cusp ruler of house 2 (finances), Uranus is cusp ruler of house 8 (taxes and debt), Jupiter is cusp ruler of house 6 (work) and Neptune is cusp ruler of house 10 (business). On the world-stage the Sun-Uranus square aspect, which commenced in March 2011, has brought political change, revolution and the radicalizing of politics and the political agenda. Uranus stands for rugged individualism so there’s been squabbling, disagreement and more squabbling and a call for freedom and liberty (Uranus) around the globe. The aspect reaches its end date on April 28, 2013, but before then progressed Moon in February-March 2013 will form friction (semisquare) aspects with Uranus and Sun giving the aspect one last burst of stimulation and more freedom fighting and political change. The Jupiter-Neptune conjunction that commenced in June 2007 was the force behind the Global Financial Crisis and the various schemes (Neptune) that have been introduced to deal with the great financial mess. But in September-October 2012 progressed Mercury in house 12 moved to form friction (semisquare) aspects with birthchart Neptune and progressed Jupiter and that’s when misguided decision-making (Mercury) was inclined to make matters worse. Jupiter rules the world’s financial markets. It’s the planet of banks. And Neptune is the planet of schemes, fraud and deception. And in some countries the schemes to solve the GFC-debt crisis seem to be an illusion (Neptune). On January 1, 2013 progressed Moon in the Aquarian Age chart had moved to form an obstacle (square) aspect with birthchart Saturn — planet of debt, unemployment and loss. 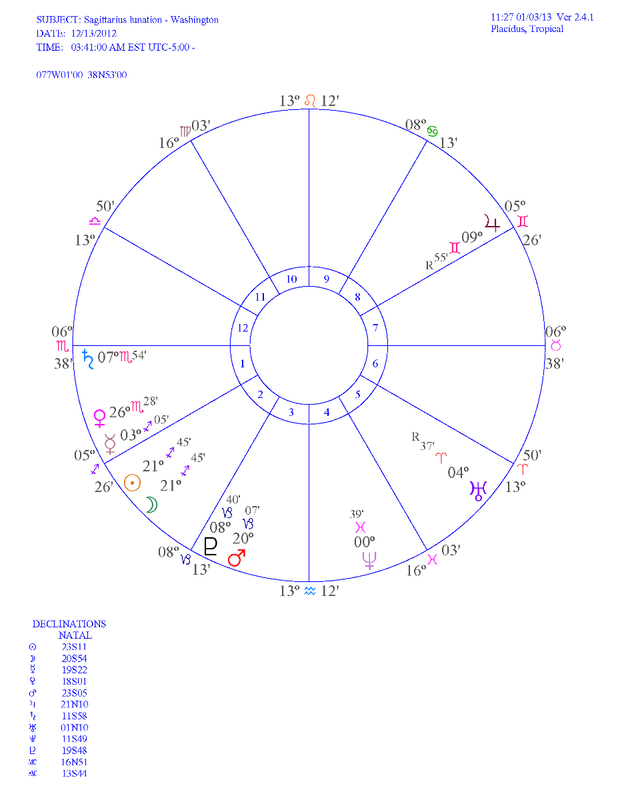 In the US chart Saturn is in house 10 — the President — and progressed MC (at 6 Leo 41) in house 2 (finances) has moved to form an obstacle (square) aspect with progressed Saturn (at 6 Taurus 55) in house 11 (Congress). This aspect focused on the political differences between the administration (MC) and Congress (house 11) and the role of selfishness (Saturn) in finding solutions to the financial and economic dilemmas. And when progressed Moon on November 23, 2012 moved to form a square aspect with birthchart Saturn it stimulated the progressed Saturn-MC square. The Moon-Saturn square aspect was perfect on December 24, 2012 and with Saturn under strong stimulation in both the US chart and its Aquarian Age chart the problem was selfishness and it always has a ‘loss’ consequence. In the 2012 Sagittarian New-Moon chart at Washington the lunation is in house 2 (finances) and it’s opposition Jupiter in house 8 (taxes). Mercury — the planet of talks and controversy — in house 1 (the people) dominates the chart. It’s cusp ruler of house 8 (taxes) and house 11 (Congress) and it’s opposition Jupiter in house 8 — higher taxes on the rich. 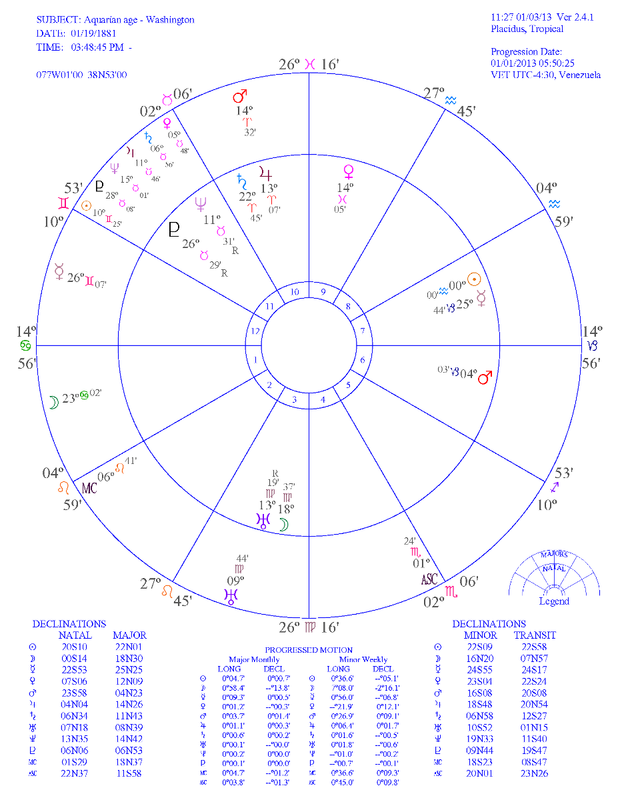 The chart highlights the fiscal cliff ‘tax’ problem and the efforts to find a solution, but the dominant Mercury marked for non-stop talk, controversy and disagreement and Saturn — in house 1 (the people) conjunction the ascendant — marked for selfishness, loss and a very worrying time.